Meiji Trinocular phase contrast compound microscope with 4 Objective Lens, 1000x magnification, flat-top stage, halogen illumination, Zernike-type N.A. 1.25 condenser with green interference filter and coaxial focus controls. 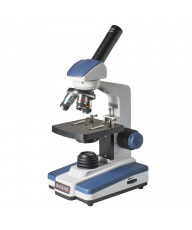 The Meiji ML5970 is a ruggedly designed binocular phase contrast microscope ideal for the clinic, classroom or research lab. It includes KHW10x eyepieces with centering telescope, 4 BF Semi Plan Phase objectives (10x, 20xS, 40xS and 100xS oil immersion) in a reversed, quintuple, ball-bearing nosepiece. 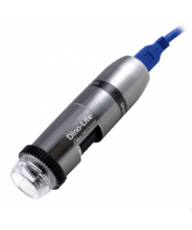 The eyetubes are inclined 30 degrees, rotatable 360 degrees and offer 52-72mm of interpupillary adjustment. 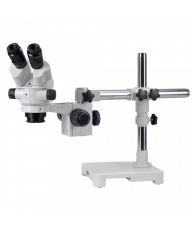 The 171mm x 140mm flat-top stage features 80mm x 52mm X-Y movement and graduated, right or left-handed coaxial controls with .1mm vernier readings. Also included are coaxial, graduated coarse/fine focus controls with tension adjustment and safety stop. 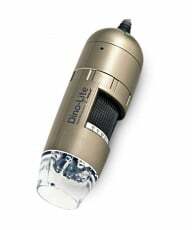 Illumination is powered by a 12v 50w halogen lamp feeding a built-in Koehler illuminator with a Zernike-type N.A. 1.25 substage condenser with green interference filter. Accessories include a manual and dust cover. 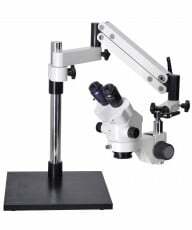 The Meiji ML5000 Series is a line of proven, dependable microscopes built around high-quality optics, true Koehler illumination and ergonomic design. They come in a wide range of configurations to suit day-to-day use in the classroom, laboratory or medical clinic.